The creative folks at IK Multimedia have announced the availability of the iRing touchless motion controller for iOS, which was first unveiled at CES earlier this year. The iRing is a double sided “ring” that fits between your fingers. On one side of the ring there is a linear pattern of three dots, on the other side there is a triangular pattern of dots. Using hand gestures, you can change effects and other settings in your music performances by moving your hands in front of your device that is running the iRing app. The app uses the front-facing camera on your device to recognize and track the exact position of the iRing in relation to the device. This position reading is then converted into music or MIDI control commands. 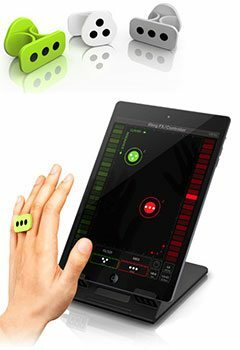 The iRing comes with 2 double-sided rings, and free compatible apps from the App Store including iRing Music Maker and iRing FX/Controller. The Music Maker app will allow you to make real time grooves and the FX/Controller app is a real time audio processing effects and MIDI controller. Check the video after the jump. iRing controllers are available in three colors (white, green and grey) and are priced at $24.99. To learn more about the iRing, visit IK Multimedia for more info. It’s the 21st Century version of the Theremin. @Sandee they are sending me an iRing to review. Should be fun!